While the Bride’s dress is clearly the star of the day, the Bridesmaid dresses are also crucial in complementing the wedding’s overall look. The Bridesmaid Dress Checklist will help you pick the perfect dresses for everyone in your bridal party. Don’t start the dress-buying process until you are positive that your bridesmaids and Maid of Honor are committed to the wedding. Once they are committed, you can really begin to map out what you want. Consider the overall look of your wedding. Is it edgy? Elegant? Rustic? At the same time, think about your own wedding dress. Is it large and decorated, or modest and flowing? You want the Bridesmaid dresses to complement the wedding theme and your own image. It’s important to speak with your bridal team and see if they have any issues. Fabric allergies can be a factor, but also ask your Bridesmaids what they are comfortable and not comfortable wearing. Some may feel upset or scared if they have to wear a backless or sleeveless dress, or others may have scars they prefer to hide. Since these are your friends, it’s good to accommodate for their comfort. There are two options when it comes to Bridesmaid dress themes: Either everyone (except possible the MoH) wears the same dress, or everyone wears a different dress that shares a common theme. 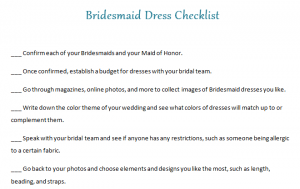 If your budget in this area is tight, it may be easier to ask your Bridesmaids to choose a dress of a certain color and length, and let them decide on straps and shoes themselves. The bridal party will still look uniform, but in a unique way. Many can also opt to have everyone wear the same dress. If so, you must remain in charge of the shopping process for this. Your friends may like different dresses, but be firm that the final decision on the dresses is yours. Once the dresses are chosen, schedule any alterations and fittings, and then zip-lock the dresses and store them in a safe place. Don’t fold or squish the bag as it will cause wrinkles.